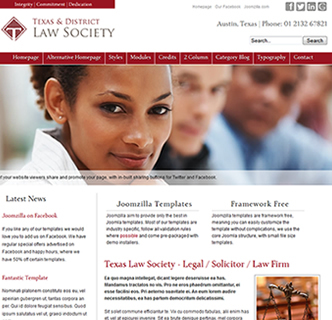 A Joomla template for all you legal eagles - Texas Legal. This template is built for law firms, solicitors, legal offices and law society's. With a range of classic colours, beautiful styling, carefully selected fonts and a quickstart installation allowing you to copy this demo this template is a must have. As well as having a beautiful layout and design this lawyers template has an alternative layout, which you can see in the demo. The alternative layout is a more simplicatic design. With this option available - along with other various options from the template manager this Joomla legal template can work in a variety of situations. The homepage slideshow portrays your legal professional or firm in its best possible light, with a classic description of the images. Place images of your team, or offices in this slideshow. There is a customized contact form, easily installed as it use's the core Joomla contact component. There are also in built sharing options to share your website on Facebook or Twitter, no need to go researching, installing and configuring additional Joomla extensions to make your website social media friendly. There are social media links to your various profiles on all the popular platforms such as Twitter, Linkedin, Facebook and Google Plus. The template also allows you to set an image as your logo, or text, not to mention a highly effective slogan which can be set from the template manager. This slogon is wrapped withing header tags, which offers SEO benefits, one of the many superb features of this solicitors Joomla template.